The PSNI Chief Constable has accused some Westminster politicians of failing to understand the dangers of terrorism in Northern Ireland post -Brexit. In an interview in the Sunday Times, George Hamilton warns that the government is failing to prepare for the impact of the UK leaving the EU on the peace and security in NI. He said that he is not getting the information and clarity needed. Mr Hamilton issued a similar warning when he appeared before the Northern Ireland Affairs Committee in June. In the Sunday Times interview, he said that any physical infrastructure or border officials following the UK's withdrawal from the European Union would become targets for dissident republicans and require police protection. "The purpose for which those checking points and [Irish] border controls would be put in place would become less and less relevant because they would move away from issues of trade or movement of people to old-fashioned security on a national frontier," he said. "That was done during the period of the Troubles rather unsuccessfully, and was sadly the subject of attacks and many lives lost." 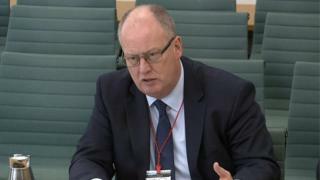 Asked if the government understood Brexit's potential consequences for Northern Ireland, Mr Hamilton said: "I'm not sure all of them do. "I have a concern some may see issues to do with the Irish border as literally peripheral, not just geographically but in terms of impact." The Sunday Times also reports that police chiefs elsewhere in the UK are drawing up contingency plans to deal with "wide spread civil disorder" at the UK's borders and ports. The newspaper cites a leaked document, which has been prepared by the National Police Co-ordination Centre, which warns that the "necessity to call on military assistance is a real possibility" after Brexit.